Several ancient Ao dai (traditional Vietnamese dress) samples were presented at the Hanoi Old Quarter Culture Exchange Center, on August 8. These dresses were restored by young designers from Y Van Hien under the advice of many leading experts and researchers on ancient costumes, such as researcher Tran Quang Duc, painter Nguyen Manh Duc and researcher Vu Kim Khoi. The Ao dai samples are traditional ao dai, in particular, they are different compared to the modern ao dai of the early twentieth century and even more different from the current ao dai. The body of the designs is wide, not waist-deep. When the design is unfolded, it creates a curve called sa ta. The ancient Ao dai consist of five laps of dress. The highlight of ancient ao dai is the seam straight in the middle of the shirt and the design uses buttons not presses. 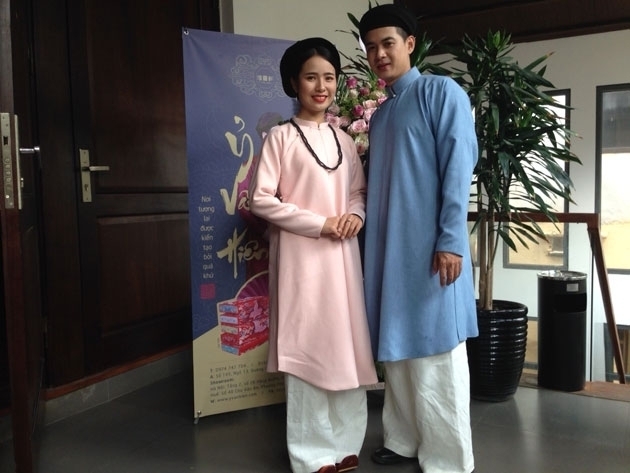 In addition, materials and colours used in the ancient Ao dai are differentiated according to the class of society. For the popular class, the material is mainly tussore and the colours are always dark tone such as brown and black. In contrast, with the high class in society, such as aristocrats, the materials are high quality fabrics such as brocade and silk, with embroidery motifs, and a variety of colours which varies by location, accompanied by accessories. Y Van Hien is a company set up by young people who are passionate about traditional culture, with the aim of coordinating with the researchers to restore the ancient costumes and ancient rituals of the Vietnamese people.